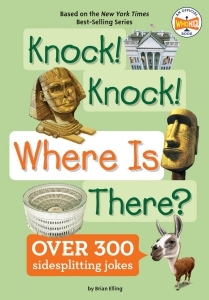 This hilarious follow-up collection of jokes featuring all the subjects of the ever-popular Where Is? series will keep kids laughing right through geography class! There are 300 silly jokes about places like Stonehenge, Easter Island, the Bermuda Triangle, Mount Rushmore, Area 51, and even our Solar System in this all-new collection. Another round of sidesplitting jokes based on the New York Times best-selling Where Is? series!